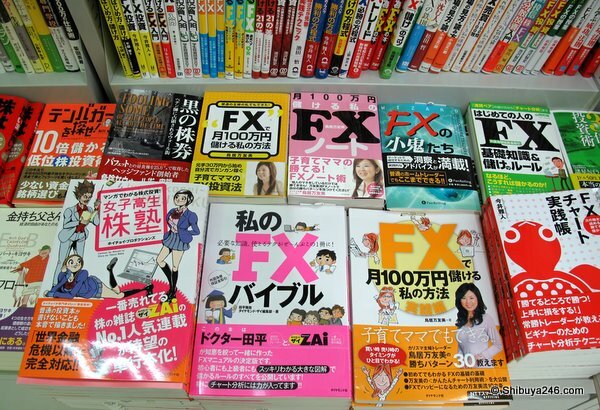 I visited the bookstore today to look for a design book and in passing the finance section was surprised to see how many books were being published to help people understand FX trading (Foreign Exchange Trading). FX has been big in Japan for some years with quite a lot of bad press being attributed to those who have made a lot of money but not properly declared it on their income tax returns. I am guessing the average person would probably lose more than they make, and therefore to assist them these books have become very popular. There were many books available, both written in manga style as shown in the first picture to the more serious books below. In particular the currency pairs of USD/JPY and EUR/JPY are popular in Japan. Before the current economic crisis many Japanese also had their eye on NZD and AUD because of the large differential in interest rates between New Zealand and Australia versus Japan. Wow, I never thought about FX trading, but it makes sense. Although nowadays it seems like more of a gamble than anything else. i read a few months ago japanese housewives have been a major force in carry trade. It is true that quite a few housewives have been encouraged to get into FX as a way to make some extra money, and that they have in particular been involved with carry trades on AUD and NZD. That interest rate differential looked attractive until the NZD and AUD both tanked during the latest economic crisis. Now the differential is not so great and the loss on swap is probably sitting about 20-30%. are there such books translated to english? I'm sure that some of those manga ones might have an English translation. For the more serious ones there are many good FX books in English already. Nowadays I do CFD (actually FX is a part of CFD trading) and invest in Japanese stock market for swing trade, while my hubby keeps trading on FX. But don't worry we do not go for high leverage, and we actually spend much time studying. I was not interested in things like that until recently but since I played Cashflow202 board game that was invented by Robert Kiyosaki, I could not help but do something for making an income streaming other than paycheck. You are right. Trading can be risky and it is not all easy gains. Markets can be difficult to understand for professionals as well as others. I am sure that is why there are so many books available. Good luck with everything. Very true, you have to be careful. Even if you do read the books it is risky.